CARE (Community, Academic, Research, Education) believes in: optimization of current therapy, innovation with new treatments, and competition to help deliver savings and accessibility; considered in ways that deliver better healthcare solutions to Canadians. Biosimilars are a relevant topic to the Canadian landscape, given the recent introduction of several biosimilars as well as others expected to be available shortly. The CARE Faculty has been looking at the impact of biosimilars since 2015, given the significance of this topic across both chronic & acute specialties. The CARE faculty is interested in better understanding the impact of biosimilars and sharing this understanding with their contemporaries. This is a primer on biologics and biosimilars, updated to reflect a rheumatological perspective. This educational report was created in conjunction with CARE™ Faculty Member Dr. Philip Baer (Ontario Medical Association), and details the basic science, management and regulatory pathways, legal perspectives and recent clinical data on biosimilars. This report is also informed by various CARE™ faculties and recent biosimilar news. This Rheumatology Biosimilars Primer is written as of July 2018 and is subject to update and refinement. It is based upon a multi-disciplinary CARE™ Primer on Biosimilars (produced Fall 2017). The second National CARE™ Congress was a great success! The second National CARE™ Congress: Update on Biosimilars and Access to Innovation was held at the Shangri-La Hotel in Toronto on April 6th, 2018. The meeting addressed questions and considerations regarding biosimilars in Canada and how they build towards a larger discussion on access to innovative medicine. The meeting included discussion and provided a platform for medical specialists and key stakeholders across multiple fields to meet, collaborate, and discuss concepts that have a practical impact on the Canadian healthcare landscape. 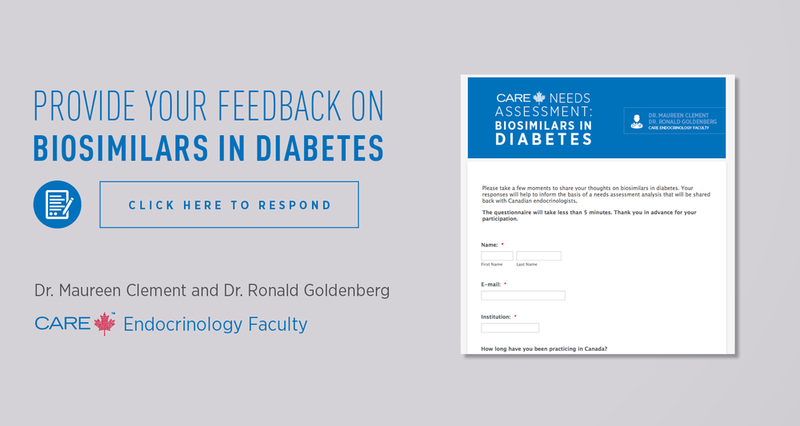 The CARE Endocrinology Faculty is looking for your insights on biosimilars in diabetes. Please take a few moments to fill out this short survey. These Congresses will take place in London, Calgary and Montreal in Fall 2017. The regional CARE Congresses on Biosimilars are an extension of the national meeting that was held on January 13th, 2017 in Toronto, ON. Select CARE Faculty members have consolidated the following guiding principles based on the collective discussion from past CARE Education initiatives that explored the anticipated impact that the introduction of biosimilars will have in Canada. This is a primer on biologics and biosimilars, updated to reflect a gastroenterological perspective. This educational report was created in conjunction with CARE™ Faculty Member Dr. John Marshall (McMaster University), and details the basic science, management and regulatory pathways, legal perspectives and recent clinical data on biosimilars. This report is also informed by various CARE™ faculties and recent biosimilar news. This Gastroenterology Biosimilars Primer is written as of July 2018 and is subject to update and refinement. It is based upon a multi-disciplinary CARE™ Primer on Biosimilars (produced Fall 2017). These Congresses were held in London, Calgary and Montreal in Fall 2017. The regional CARE Congresses on Biosimilars are an extension of the national meeting that was held on January 13th, 2017 in Toronto, ON. CARE Perspectives explores abstracts and research presented at both the 12th annual ECCO (European Crohn’s and Colitis Organisation) congress held in Barcelona, Spain (February 15-18, 2017) and the CDDW (Canadian Digestive Diseases Week) meeting in Banff, Alberta (March 3-6, 2017). On Friday, January 13th, the CARE™ Faculty specialists representing the fields of gastroenterology, hematology, oncology, respirology and rheumatology met to consider the integration of biosimilars into the Canadian healthcare system. Research continues to consider how to optimize the use of current biologic agents, drive innovation of new agents, and investigate how increased competition will affect practice, due to the introduction of biosimilars. This issue of Gastro-Times reviews these three key topics as they apply to the Canadian landscape. The CARE Congress Report on Biosimilars summarizes presentations given by a variety of stakeholders at the event. The Congress was chaired by Dr. John Kuruvilla from Princess Margaret Cancer Centre, and Dr. John Marshall from McMaster University. Dr. Hartmut Grasemann from SickKids Hospital facilitated the meeting. CARE Gastroenterology Faculty lead, Dr. John Marshall (McMaster University), sat down with Dr. Brian Feagan (Professor of Medicine at the University of Western) to critically assess this study and discuss how the results should be interpreted and applied in Canadian practice. Biosimilars are a reality in Canada. In an effort to promote a shared understanding of the range of issues, perspectives, and developments related to the use of biosimilars, the CARE Gastroenterology Faculty recently conducted a needs assessment. What follows is an overview of the key takeaways from the needs assessment, along with the response data.